We are now what we had been—–By doing nothing Right then, that is how we had ended up to what is Today!! If we choose to remain as what we had done, then we will expect nothing more than what we already had today!! Malay, Chinese and Indian are all Malaysian brothers and sisters. But BN has screwed Malaysians and Malaysia up. 2) Entry to the local universitie s and best courses such medicine, dentistry, law, Malays will get it first irrespective of quality. Residential hostels, Matriculation courses, MARA Uni , Malays will get 90% to 100%. (By the way, matriculation exams are internally set by own lecturers – about thousands of straight A’s students in Matriculation compared to the straight A’s STPM which are few. 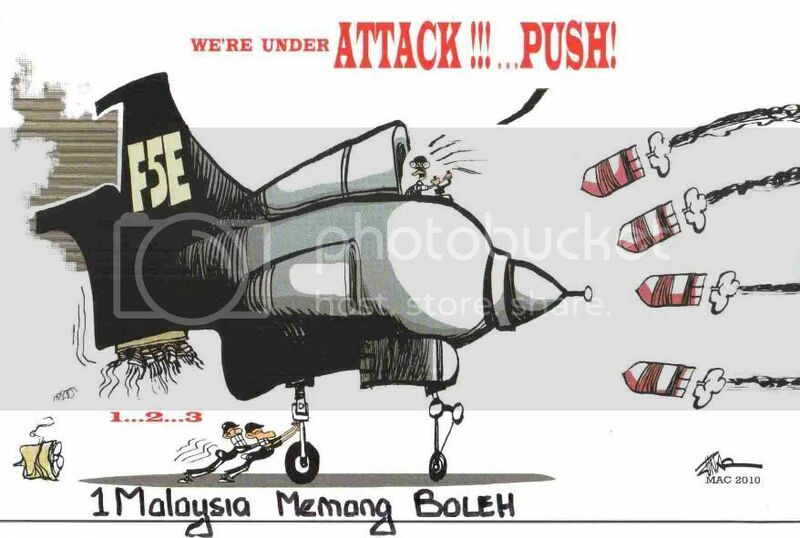 This is “Malay meritocracy vs Malaysian meritocracy”! 4) Business Contracts, Malays will get it first irrespective of who can offer the best value, quality and unblemished track record. Even when blacklisted, Malay associations have the right to complain because the rakyat owes them a living. 6) Low cost houses, lands, houses even bungalows , Malays will get it first because they are the supreme race and the rest of Malaysians are immigrants. Quotas for Malays are 30% to 50% with steep discounts to be subsidized by the rest of the Malaysians. 7) Important Senior management jobs, CEO positions in government linked companies, Malays will get it first irrespective of the best qualified and most capable Malaysian candidates. 9 ) Religious land for worship or terms of God , Malays own it and the rest must obey. Now you know why it is Malay 1st, Malaysian 2nd Education, welfare, economic, business policies are to benefit Malay first then Malaysian 2nd. The rest of the rakyat, who works hard, contribute to nation building will continue to be Malaysians 2nd.. So it is not so difficult to understand if a Malay Indonesian Badminton player is paying against a Chinese or Indian Malaysian, those who subscribe Malay 1st, Malaysians 2nd will cheer for the Malay badminton player. When there is a citizenship application of a Malay Indonesian and a qualified non Malay, the Malay Indonesian will get it irrespective of merits. That is why we have Malay is 1st class other Malaysians 2nd class. This is the only country that has racism and special rights enshrined in the constitutions because Malay is supreme. So if you have the opportunity to migrate to be treated fairly and justly,why stay? Malaysians 2nd means you will always be an immigrant. Why become an immigrant with 2nd class rights when other countries are willing to give you the same rights. Wise UP Malaysians! Vote wisely. KHOO KAY PENG IS RIGHT. HOW CAN NAJIB WALK HIS TALK??? TIME IS ALSO RUNNING OUT! 1 . NAJIB CANNOT EVEN DIFFERENTIATE BETWEEN THE 1MALAYSIA CONCEPT & THE RACIAL POLITICS CURRENTLY PRACTISED BY THE MANY MALAY POLITICIAN IN UNMO. 2 . IN THIS CASE WHERE IS THE FUTURE OF 1MALAYSIA??? IN OTHER WORD, IT IS ONLY NAJIB’S SLOGAN & WE CANNOT SEE HOW IT WILL WORK FOR ALL MALAYSIAN IRRESPECTIVE OF RACE!! 3. 1MALAYSIA CONCEPT WILL NEVER WORK IF HE CANNOT STOP THESE MALAY POLITICIANS FROM TRYING TO CHAMPION MALAY SUPREMACY OVER OTHER RACES IN THE COUNTRY! PLEASE PASS ON THIS EMAIL TO AS MANY MALAYSIAN AS POSSIBLE SO AS TO ENABLE THEM TO ASSESS THE 1MALAYSIA SLOGAN ADVOCATED BY NAJIB……. ….. …. ……… ……. Khoo Kay Peng speaks out.. Can Najib Walk his Talk? PM Najib is forced to go back to the Barisan old script when he was asked to react on his deputy’s statement that he was “Malay 1st, Malaysian 2nd”. Najib defended his deputy, “Being a Malay doesn’t mean that you are against 1Malaysia or you don’t think like a Malaysian.” “Similarly, if you are a Malaysian Chinese, it doesn’t mean that you don’t think like a Malaysian or subscribe to the concept of 1Malaysia,” he said. Najib’s knee-jerk reaction on Muhyiddin’s statement unmasks his own understanding about nation building and the 1Malaysia concept . The lack of national affinity and shared destiny is the main obstacle for 1Malaysia. It is sad to note that the 1Malaysia founder himself does not share the vision of nationhood and citizenship. If Najib does not trust his own nation building agenda, he should not have misused the name, Malaysia . 1Malaysia is not consistent with Ethnicity 1st, Nationality 2nd. We cannot blame Muhyiddin for his lack of national identity because nation building was not featured in the Barisan rule over the last 5 decades. Barisan is an antithesis to 1Malaysia and nation building. The most important element in a nation building project is to outlaw racial discrimination. Barisan is the epitome of racism and racially based politics. Najib cannot remain coy and silent on the demands, attacks and allegations made against the Chinese community, in particularly, by Perkasa. “We, the Malays have forgiven them a lot, we have sacrificed a lot of our interests,” he added. I would like Ibrahim to clarify what interests? It appears that Muhyiddin is now clamouring to ride on Perkasa’s wave by declaring that he is “Malay 1st” and “Malaysian 2nd”. Regardless of the publicity stunt and damage control, Najib knows that his defence of Muhyiddin and his statement is going to tear his concept to pieces. His administration is dragging its feet on the NEM details and mechanism. It makes us wonder if there is any meat at all in NEM. Time is running out for him. Another talk but no walk is going to put him on the same pedestal as Abdullah Badawi. Najib should state his stand on Perkasa and Ibrahim Ali’s disrespect for non-Malay citizens. They (Najib, Muhyiddin and Ibrahim) should remember that their salaries and perks are paid by Malaysians of all races. Not by the Malays onl y. Posted by Khoo Kay Peng . If you had never voted… for once in your life… VOTE in the 13th GE. This is your time! NOW that is really Malaysia at the worst Bodoh!!! Did US agree to send the English teachers or Msia ask for it? Anyway, there are good English teachers in Msia but they are all giving private tuition. For Allah sake, if you have curriculum in English, the you don’t need USA English. American English is different from British English!!! WASHINGTON: Volunteer teachers from the United States will soon be heading round the globe to teach English in Malaysia. The US government has agreed to Malaysia’s proposal to revive its Peace Corps programme after a 21-year lapse and will send their teachers over once a mechanism has been worked out. The move, in the wake of improved relations between both countries, will help alleviate the shortage of English teachers in Malaysia and improve proficiency of the language. “If possible, we want to start (the programme) this year,” said Deputy Prime Minister Tan Sri Muhyiddin after a meeting with US Secretary of State, Hillary Clinton on Friday. With the nod from the US government, Muhyiddin, who is also Education Minister, said his Ministry could now draw up details on the implementation of the programme and present it to the Cabinet. Prime Minister Datuk Seri Najib Tun Razak first made the proposal to revive the programme when he met US President Barack Obama in September last year. The Peace Corps, which was very popular in the 1960s, is an American volunteer programme which provides technical assistance and helps people outside the United States to understand their culture and expose Americans to the cultures of other countries. Najib had said Malaysia was prepared to partly sponsor the programme of bringing in qualified teachers to teach English. Clinton extended a warm welcome to Muhyiddin during their meeting on Friday, describing it as an “excellent meeting”, just like their last one in Kuala Lumpur in November. “It is very exciting for the breadth and depth of our relationship to be on such a positive track, and I look forward to continuing to work closely with the Government and people of Malaysia for a better future,” she remarked after the meeting at the Department of State. Speaking to journalists later, Muhyiddin said Clinton was impressed with Malaysia’s achievements and felt it could be a role model for other developing countries. She had cited three criteria that Malaysia met for a model country – having a democratic and effective government as well as economic growth. Muhyiddin also updated Clinton on Malaysia’s participation in the Trans Pacific Partnership which he regarded as a 21st century agreement that would further boost trade for the eight member countries. PETRONAS; PM/UMNO’s PRIVATE PIGGY BANK. Dr. Tan Kee Kwong on PETRONAS; PM/UMNO’s PRIVATE PIGGY BANK. Tan Sri Dr. Tan Chee Khoon… .. I learnt with alarm that for the past 3 years, Petronas has given to the Federal Government 290 billion ie 290,000 JUTA! Wow, what a fantastic sum of money. Please Najib, Pak Lah & Mahathir, tell us the rakyat how you spent or wasted this huge sum of money. As I have said before, Petronas as an entity, was & still is quite a well run company. But the past 3 PM,s have ruined it all. By a special Act of Parliament passed in the 70’s PDA i.e. Petroleum Development Act, Petronas is only accountable to the PM ONLY. In the past we had 2 Oil Ministers who had no say at all. Even under PDA, the Minister of Finance has no say at all. Even the Cabinet cannot examine the true accounts of Petronas. What a shame ! This is totally unacceptable. You can rest assured that the incoming Pakatan Rakyat Federal Government will change all that. Those that have plundered the wealth of the nation had better watch out, you will be charged & sent to jail for a very long time ! Under Mahathir, Dividends paid to the Govt was about 2 to 3 billion annually. The so called Mr Clean i.e. Pak Lah forced Petronas to pay 10 billion then 20 billion finally to pay 30 billion. During Mr Clean tenure as PM dividends paid was 10x what was paid during Mahathir’s time . . . . ???! Where did all this money go ? 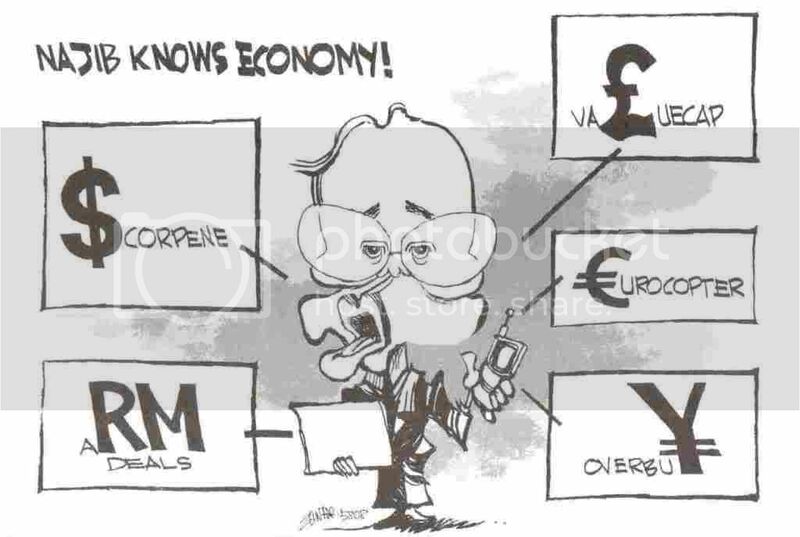 Mainly to finance all the budget deficits during his rule. A lot went to useless Defense spending. Also the nation only got 10 billion worth out of 30 billion ! In the 80’s& 90’s about 100 billion was spent from Petronas coffers to bail out Bank Bumiputra TWICE . Also during the finacial crise of 1997, Petronas was forced to buy MISC to bail out Mahatir’s son. I remember in the mid 50’s my family stayed for 2 years in no 2 Jalan Penang . At that time there was only the Race Course there. As kids we enjoyed plucking the delicious rambutans there. Now it is so different. Initially the plan was to build a new HQ in Jln Tun Razak, opposite the Royal Sgor Golf Club. (site of the present Prnce Court Hospital ) That plan was aborted as the DCA(Dept of Civil Aviation) objected strongly as it was in the flight path of the Sungai Besi RMAF Air Base. Then Petronas went ahead to buy a piece of land in Jalan Ampang, behind Yow Chuan Plaza for only 30 million. Suddenly Mahathir intervened & came out with a devious plan to steal the money from Petronas to enrich his special crony etc. First there was the outcry in the press on how the Race Course was causing massive traffic jams every week-end. So the Federal Government & DBKL decided that the Race Course must shift to Sungai Besi, its present site. If the land was sold/surrendered from the Turf Club to Petronas direct that will be perfectly OK. BUT the Turf Club was forced to sell its land to a very special Mahatir Crony. 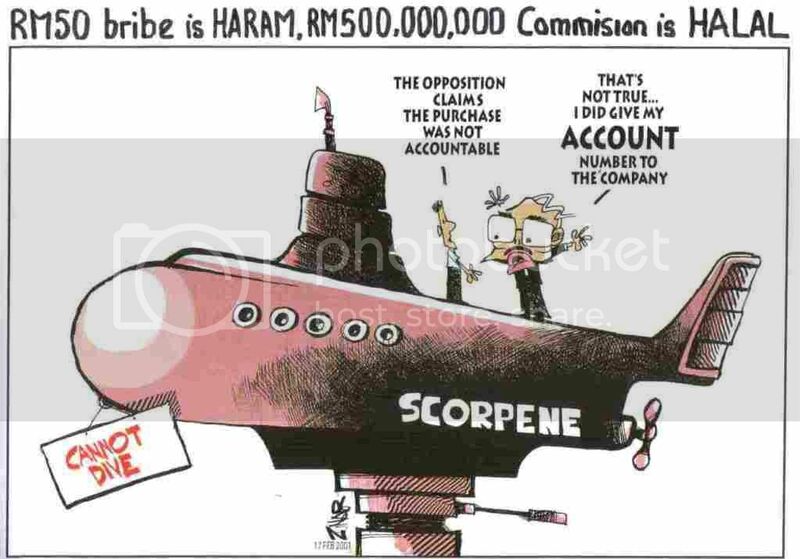 Within a matter of a few months the special crony sold the land to Petronas at a huge price of 600 Million ! ‘ CANNOT negotiate the price, just pay ! ‘ . How ridiculous, who pays 600 million without even a one dollar discount . . . ??! Another ginormous scandal that cost the nation US100 BILLION. Recently Mahathir wrote in his blog site that 3 weeks before Pak Lah stepped down as PM he “gave’ the above land to Brunei . Wonder what made him do that, maybe in one of his naps in public he just assigned our rights to Brunei . I am sure it was not for free, many relatives & cronies benefited because this is a business deal, not an NGO doing charity. In the past Petronas went into joint sharing agreements with Vietnam , Cambodia , Thailand , Indonesia etc This should have been the case in Block L and Block M.
Sarawakians , plaese wake up ! ! ! You stay in on of the poorest states in Malaysia . Your Ketua Menteri(Pek Moh) is so blatantly corrupt that even his BN broyhers in SUPP are complaining..
UMNO/BN plase come clean on the real affairs of Petronas. Examine the real cause of the severe drop in FDI. Not only that even the local tycoons have very little faith in this country. Don’t you care…!??? Every year at least 400,000 finish their SPM examinations. With this state of affairs what is going to happen to them ? Don’t just enrich yourselves, give a little bit back to the Nation ! More people in the know should write more such revealing articles! Subject: Fwd: Fw: Fwd: Now,Who is the traitor? NOW, WHO IS THE TRAITOR? Salam. I read with great interest today papers about your comments. In it you were quoted that those who talk bad about Felda & called it bankrupt are to be regarded as traitors to the Nation. The sad truth is that after you took charge of Felda in 2005, you turned what was a very successfulorganisation into a financial nightmare. In fact you are the traitor who has stolen the poor peneroka’s money. I am sure you know that for the next General Election, Felda schemes & their votes determine about 60 Federal Parliament Seats. From my feedback, many of the peneroka are boiling mad. They have been exploited & taken for a ride. Why the many cash handouts? looked after Felda properly the cash reseves should now be at least RM8 billion. 2. New Felda HQ in KLCC. to this conclusion when the building is not even finished or sold! thta since day one it has been losing money, in fact it has lost RM300 million. Since you say we are traitors, tell us in detail what has happened . the cattle project have to be kept in an air conditioned room 24 hours a day! 4. Why the need to borrow from EPF? Before you started on Felda Global Ventures. Felda never borrowed from EPF. tried to get his OWN money back, but the Felda administration has refused so far. 6. Felda settlers to camp outside Felda HQ. & happening in many. many schemes round the country. remaining cases in court. Good for you, you will make mare peneroka angry with you! 1. Subject the whole of Felda to an independant audit & publish the findings. *DR TAN KEE KWONG IS THE SON OF THE LATE TAN CHEE KHOON. He was also a former Deputy Minister of Land and Cooperative Development. Pls pass this important message to all your relatives, friends and contacts (who are still Malaysians). Those living overseas pls help to fwd this e-mail. This message below is directed to All Malaysians. If you are not a Malaysian, then take it for information sake. Politics itself is not dirty, but it’s people who make it dirty….so it depends on which side of the fence you are in. Thanks to W.F. Cheah for sharing this article by William Leong. William Leong is the treasurer of PKR and younger brother of ex minister, Paul Leong. Practicing in law for 20 odd years before going into politics. 1. They are extending the APs to 2015 ! They are giving themselves free money. This is daylight robbery. We are talking big bucks, billions/year from the rakyat (including common Malays). 2. The taxes and duties on cars continue to be high to protect Proton but we the public pay through our nose. If the PR government comes into power we can expect prices to drop by at least 50% for imported cars. Why are we paying these cronies our hard earned money so that they can drive around in their new and latest Ferraris, BMWs etc. 3. Have you noticed that they appoint themselves to high paying jobs and positions where they can also earn additional side incomes? Again, these side incomes run into billions. 4. The Accountant General reported that RM 28B was wasted by you know who and for who. These figures probably do not involve the highly secretive arms contracts which run into another many billions. 5. Look at the way they snatched the Perak State government. 6. Look at the way they treated Teoh Beng Hock. 7. Look at the way they are trying to get Anwar. 8. Look at the Lingam case. No action taken even after Royal Commission had confirmed his wrong doing. 9. 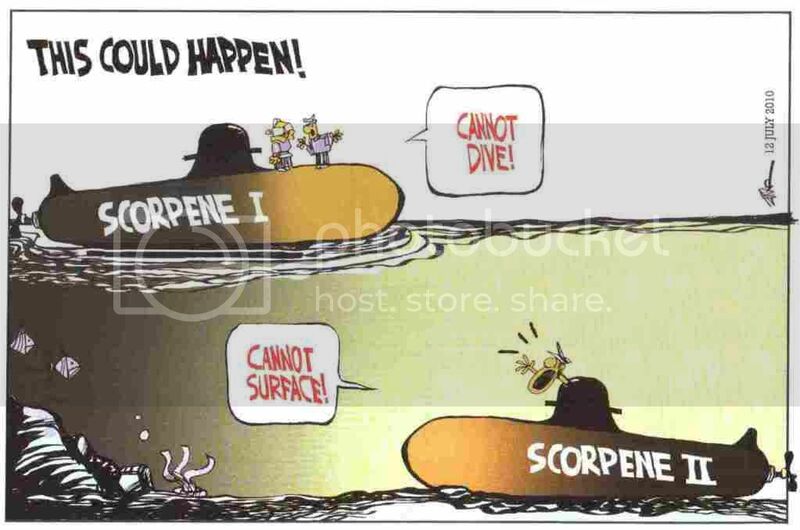 Look at the PKFZ delaying tactics, get one report after another, and then another and if necessary another and then only the small fish get caught and hauled to Court. What a way to fool us? Either they are stupid or we are stupid. The abuse and cheating has been going on for far too long. Only you and I, and together with all Malaysians who care, can stop them. Between now and the next General Elections, we have to campaign now as if the GE is just 6 months from now. Not only do we campaign, we must get our friends to get others and others to do the same. Let us not be fooled again and again. Look at Indonesia, Japan, S. Korea and Taiwan, all their old and corrupt parties have been replaced, Malaysia should be the next. our people have not enjoyed real liberty, democracy or justice. Without liberty, democracy or justice there is no independence. In these 52 years the oppressive rule of a foreign colonial master has been replaced by the oppressive rule of a local master… with an iron fist. They use the same instruments of oppression as the British did. They use the ISA, the Sedition Act, the Printing Press & Publications Act and detention without trial. The freedom of assembly, the freedom of expression and the freedom to live a life of dignity free from fear and oppression are illusions. In these 52 years the yoke of a foreign colonial master has been replaced by the yoke of a local master. They use the same policy of “divide and rule”. They survive by feeding off racialism. They survive by fostering divisiveness. They survive by preaching religious intolerance. What Teoh Beng Hock died for? Malaysians will not know real independence, will not be free and will not enjoy democracy unless this oppressive regime is thrown out. They must be thrown out and pay for what they have done to Teoh Beng Hock. We must not forget what he stood for. More importantly, we must not forget what he died for. He lived to help Malaysians in the struggle against corruption and oppression. He died so that our struggle can live. He died fighting for justice. What Justice? Without justice we cannot say we have liberty or democracy or equal rights. We cannot say we have liberty or freedom when Tamil schools have no tables and chairs. When in Sabah and Sarawak, schools have no electricity. A child that is illiterate is not free. We cannot say we have democracy or equal rights for women, when a Chinese girl with 9A1s cannot enter a university.. A girl without a job has no rights. We cannot say we have freedom of choice when a man cannot feed his family. A starving man has no choice. Liberty, democracy and freedom are meaningless words when there is no justice. Justice is political liberty. Justice is economic independence. Justice is equality. There is no political liberty when you vote out of fear. There is no economic independence when you give your support out of fear your son’s scholarship will be withdrawn or your license will be withdrawn. There is no freedom of choice when you elect a party out of fear for your contract or your business. This is what has been happening in these 52 years and this will continue if we do not act. There will be many more Teoh Beng Hocks and many more Port Klang Free Zones if we do not stop them. What One Malaysia? Najib says he wants One Malaysia. Teoh Beng Hock’s death has shocked us back to reality. We cannot just listen to rhetoric. We must look at the deeds. When we look, we see what has been done, is a far cry from what has been said. The Perak government has been stolen from its people. Najib has now declared his intention to grab the Selangor government. The MACC is a tool. It is used to de-stabilize the Pakatan Rakyat government. Teoh Beng Hock was interrogated throughout the night. He was grilled for buying RM2,400 worth of Malaysian flags. No one has been grilled when PKFZ loss RM12.6 billion. The MACC officers are raiding the Pakatan Exco members’ office so often they are becoming fixtures. Cars and cows and Malaysian flags have become a fixation of the MACC. 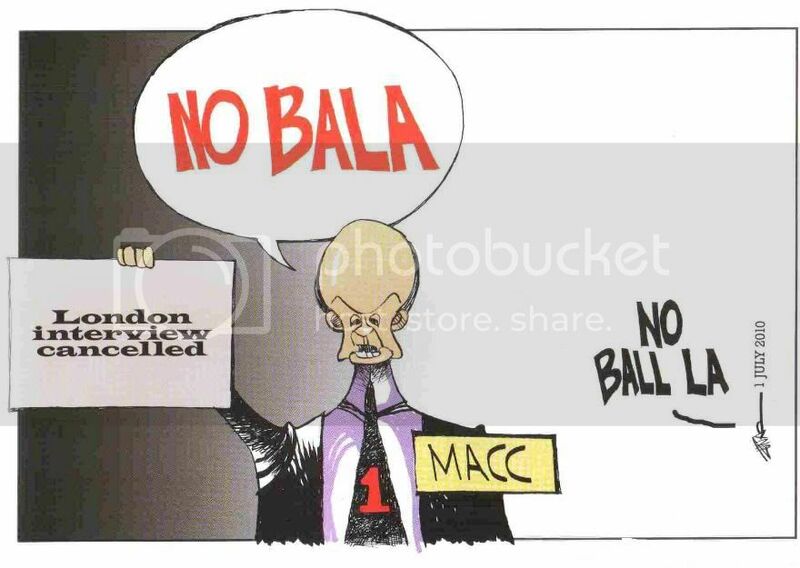 MACC has not shown the same enthusiasm when it comes to BN assemblymen who used up their annual allocation of RM500,000 in 2 months before the general elections. The MACC has also not shown any interest in the trips by the former chief minister and his family to study the river system in Disney Land. 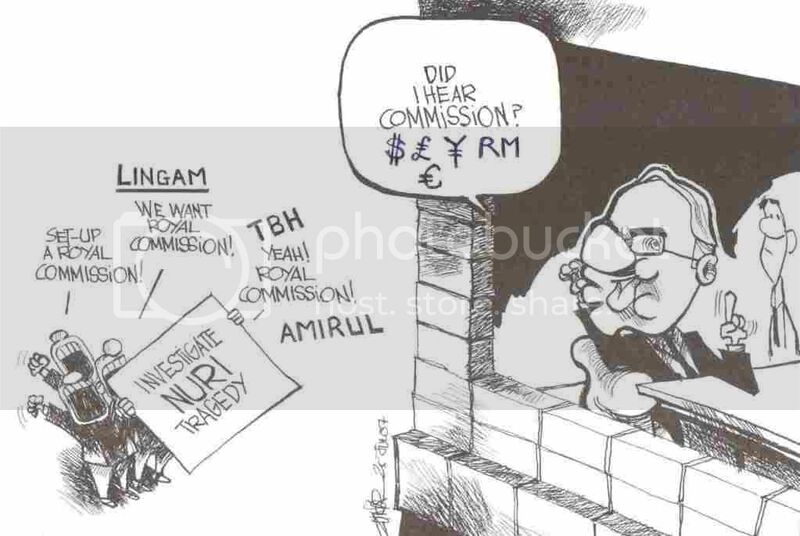 There is no investigation into how the former chief minister can afford to purchase a multi-million ringgit mansion that is beyond the means of a chief minister’s salary. Barisan Nasional machinery is now on the move. Books attacking Anwar Ibrahim and Khalid Ibrahim are being distributed. The authors of these books are sowing the seeds of hatred and contempt. They desecrate the Hindu’s sacred cow in a protest filled with bigotry. They protest against a Hindu temple built 150 years ago when the area was a plantation that today, just like its devotees, the estate workers, had been left behind by development. They have forgotten Muslims were invited to practice their religion amongst the people of Yathrib. They are beating the drums of race and religion and the tone is becoming harsher with each beat. The people must now decide. There cannot be any fence sitters. There is no middle ground. When Teoh Beng Hock was thrown out of the window on 14th Floor, the people of Malaysia was thrown together with him into the sea of political troubles. Whether Malaysia will sink or swim is now up to the people. The people must decide once and for all what is right and what is wrong. There cannot be a neutral ground. Today in Malaysia there is no place for neutrality. Malaysians must make their choice now. If we want to know what is evil and what is right, we must use our moral compass. It is only when we know the direction where justice lies can we know where we must stand. Do we want to choose liberty and justice which are always right or do we want to choose corruption, hatred, arrogance and oppression which are always wrong? Every Malaysian must make his stand. When you stand for liberty we stand with you. I want to tell you that when you stand for liberty, we will stand with you. When you defend democracy, we will be your shield. When you fight for justice, we will be your sword. They assaulted *Anwar Ibrahim. *They threw him in jail for 6 long years. They call him a traitor and worse. But Anwar will always be here to fight for you. They hounded and harassed *Lim Kit Siang. *They detained him in Kamunting. But Lim Kit Siang will always be here to stand by you. They attacked *Tok Guru Nik Aziz *and tried to humiliate him. But Tok Guru Nik Aziz will always be here to protect you. We have been tested. They have thrown everything they have at us but we are still standing and we are still here. We were here in November 2007 when a sea of yellow marched for a free and fair election. This was *BERSIH*. We were here in December when thousands in orange marched for equality. This was *Makal Sakthi*.This was the ripple that started the tsunami. Barisan Nasional was swept out of 5 states. Since then Barisan Nasional has become more extreme in their policies. They have become more brutal with the people. When we Hope So on 1st August, the lovers of justice and liberty marched again. Again Barisan Nasional responded with violence and brutality. 638 people including women and children were arrested. Despite the police shutting down the city, despite the many road blocks and barricades, despite the arrest of those wearing black, the number who succeeded in gathering far exceeded my expectations. But the size of the gathering cannot be bigger than my hope for Malaysia. My hope is for every one that braved the tear gas and water cannons there will be many thousands more. We want hundreds of thousands to march with us. We will march from under the shadow of fear into the light of justice. My hope is that the flame burning in each who gathered that day will kindle the hearts and minds of many thousands more. Malaysians will find the courage to standup for principles and convictions. We must stand up for what is right. This is my hope and this is the hope of all Malaysians. Truth, love and justice will prevail over the forces of hate and oppression. This will only happen when the silent majority refuses to remain silent anymore. This will only happen when the voice of the majority is finally heard. We must be confident that oppression and corruption cannot endure. We must take comfort that truth and justice will always prevail. But this can only be achieved if we fight for it. We must fight today for a better tomorrow. Do not let our children look back and say that these are dark days. Let them say that these are great days. These are the most glorious days that our country ever had. These days will be remembered as the days when we were called, we answered. We stood up! We stood together shoulder to shoulder irrespective of race or religion. We fought and we prevailed. Each of us played our part according to our strengths. Our children and their children will look back on these days and celebrate it as the days we became *ONE NATION*. These days will be etched in our Nation’s history as the days we won over injustice and oppression. These will be the days we celebrate *THE TRUE MERDEKA*. …………. ……… ……… ……… ……… ………. ……… ………. ……… ……… …………. ……… ……… ……… ………. TO MALAYSIANS OF ALL RACES, IT’S TIME TO STAND UP AGAINST CORRUPTION! IT’S TIME TO STAND UP FOR JUSTICE AND TRUTHS! IT’S TIME TO FIGHT FOR OUR TRUE MERDEKA!